Perfect cabin for a romantic getaway! There couldn’t have been a better cabin for my fiance and I to rent for our romantic getaway! The cabin is very secluded, there are neighbors but we only heard them a little bit the first night we were there. The porch with the hot tub faces into the woods with a view of the mountains and total privacy. While it is out away and private, we were still only a 20 min drive from Gatlinburg and 30 minutes to Pigeon Forge and Sevierville. Far enough for your privacy but close enough to go see the sights as you want. The bedroom was fantastic with a big and comfortable bed and the jacuzzi tub along with a TV and DVD player to wind down and relax after a long day of hiking. It also has a large window with a mountain view. A previous view said it was hard to sleep in due to the large window but we didn’t have this problem as the woods provided just enough coverage. Although we didn’t use it, there was also a nice big pool table downstairs. The kitchen was fully stocked with dishes, silverware, pots and pans. It also had a fridge, stove, dishwasher, coffee pot and toaster. There were a number of spices in the cabinet for use along with any cleaning supplies that would be needed. We most definitely enjoyed our trip and the Lazy Bear cabin greatly contributed to that! 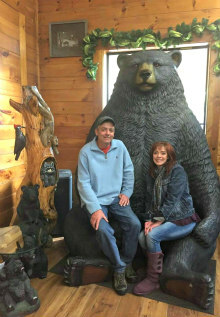 We are already talking about a return trip to the Smokey Mountains and Lazy Bear cabin is our intended destination! ← A very homey place to spend your honeymoon!